Good news for brunch lovers: You can now sate your cravings for mid-morning cocktails and rustic Southern fare like fried chicken and beignets starting this weekend at the gorgeous Descanso Gardens. 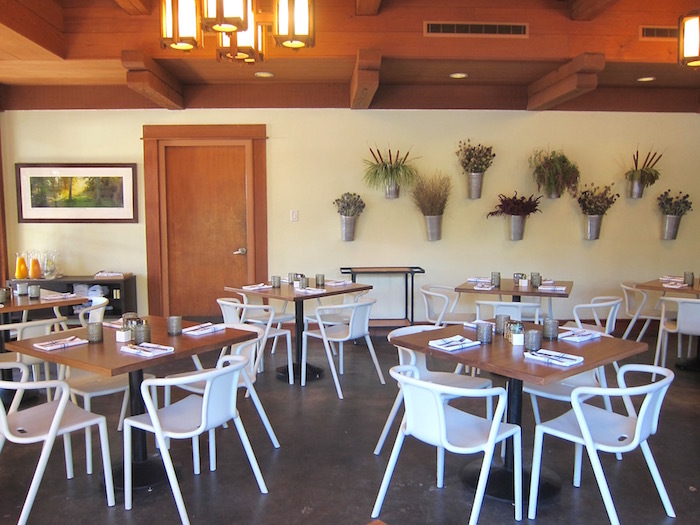 The charming Maple restaurant opens its doors on October 1. The design of Maple is akin to a casual dining hall that would be found inside a hip adult sleep-away camp. Walk towards a Craftsman building by the entrance of Descanso Gardens to get into the eatery. You&apos;ll find a nondescript wooden sign with the word "Maple" etched into it, something you could easily miss if you aren&apos;t paying close attention. Step inside and you&apos;ll see exposed wooden beams, and find a wall decorated with artsy wooden spoons and another with vintage maple syrup buckets filled with leafy garden plants. The walls open up from floor to ceiling, bringing lots of natural light into the space. Outside in the patio, there are grape vines creeping over the brick-lined walls. Hop onto a wooden stool to sit at the large communal tables under a shady umbrella in a space that&apos;s surrounded by succulents. French-trained chef Mark Salazar—after making his bones at other Patina Restaurant Group restaurants like Nick & Stef&apos;s and Patina—is cozying up quite nicely in his role as executive chef at Maple. At Maple, picture a casual brunch (even with a kids&apos; menu) that uses seasonal ingredients and has some Latin-inspired flavors thrown into the mix. Take for instance, one of Salazar&apos;s starters, a dish simply named "street fruit." It&apos;s a straightforward offering consisting of juicy chunks of fresh mango, pineapple, jicama and cucumber; it&apos;s dusted with Tajin chili powder and served with a side of crumbled cotija cheese and a wedge of lime. He wanted to pay homage to his fond memories of growing up in L.A. and bring to Maple the kind of stuff you can get from street vendors in downtown that you wouldn&apos;t normally be able to find in the suburbs of La Cañada Flintridge. It&apos;s apropos that Salazar&apos;s menu has a lot of seasonal ingredients like this, since Maple is smack dab inside of a botanical garden. He says many of his dishes have a lot of moisture (like his very simple and rustic asparagus salad with baby frisée), so that your "palate gets the full experience and all textures are involved." But don&apos;t be fooled, not everything on this menu is light and plant-forward (though we suggest not skipping out on the refreshing trio of seasonal sorbets at the end of the meal). We got a chance to sample at an early preview of the restaurant some of the heavier, brunch-ier items like a crispy buttermilk-and-thyme fried chicken paired with house-made beignets sprinkled with powdered sugar and a sidecar of Vermont maple syrup. Accompany that with Patina Restaurant Group&apos;s mixologist Evan Charest&apos;s light and crushable tomatillo bloody mary cocktail—one that served in a massive tumbler—and you&apos;ve got a cure for a hangover. 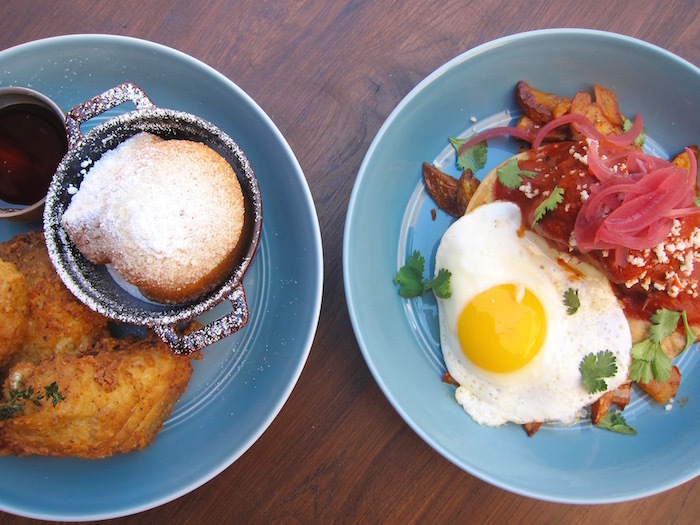 One of Salazar&apos;s standout dishes is his huevo ranchero that has a melt-in-your-mouth, 3-ounce guajillo chili-braised short rib topped with a runny sunny-side-up egg and sits on a bed of tortilla chips and a potato-fennel hash. The spice from the chili peppers isn&apos;t something that would top the Scoville scale, but it&apos;s utilized as a way to punch up the dish with smoky and sweet flavors. As for the short ribs, Salazar was inspired to make them because it reminded him of his childhood, of those days his family would have tamale-making parties. Before his mother would be done making the tamales, the children (himself included) couldn&apos;t wait to eat, so they would use the tamale beef fillings to make burritos to stave off their hunger in the meantime. "It was one of our favorite things growing up," Salazar says. If you still have some room for dessert, there&apos;s the option of ordering fluffy brioche french toast served alongside scoops of seriously decadent whipped bacon butter—that&apos;s right, rendered bacon fat mixed with butter and crispy bits of bacon. It&apos;s a straightforward dish, save for the guilty pleasure of pork fat, but if we had to make a choice for something sweet, we&apos;d suggest going for the moist banana nut muffin (that&apos;s more like the size of a pound cake log rather than a mere muffin) instead. It&apos;s drizzled with warmed maple Nutella and accompanied by chantilly cream and frozen vanilla custard. Think of this as your cheat day. Besides beer and wine, there are over a handful of specialty cocktails that come bottled. Charest has put his personal touch on the refreshing patio libations. For something well-balanced and a little unusual, try his maple Moscow mule, which has joined Vermont maple syrup, vodka and ginger beer in holy matrimony. Now that Descanso Gardens has a sit-down restaurant, you can easily make a whole day out of visiting the beautiful 160-acre garden. Some of the highlights in the next few months include camellias, roses and fall foliage. Brunch will take place on the weekends indefinitely from 9 a.m. to 2 p.m., but if you want to get a taste of the seasonal dinner service, you can do so for a limited time from November 25 to January 8, from 5 p.m. to 10 p.m daily. It&apos;s to coincide with the garden&apos;s ticketed "Enchanted Forest of Light" experience, which is a one-mile walk through interactive light displays for the holidays. You don&apos;t need to purchase a ticket for the Enchanted Forest experience or for Descanso Gardens to visit Maple. There will be direct access to the restaurant from the free parking lot there. But we do suggest making a reservation for brunch or dinner ahead of time on opentable.com because spots are already filling up quickly. Maple is located at Descanso Gardens at 1418 Descanso Dr., La Cañada, (818) 864-6435. 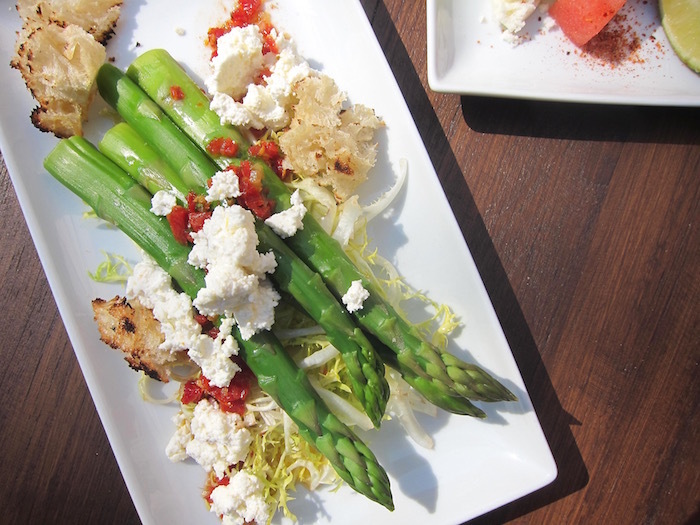 Brunch dishes from $4 to $15, and beverages from $3 to $16.